Webster Public Relations is blessed to work with some of the best-selling and most influential artists of all time. 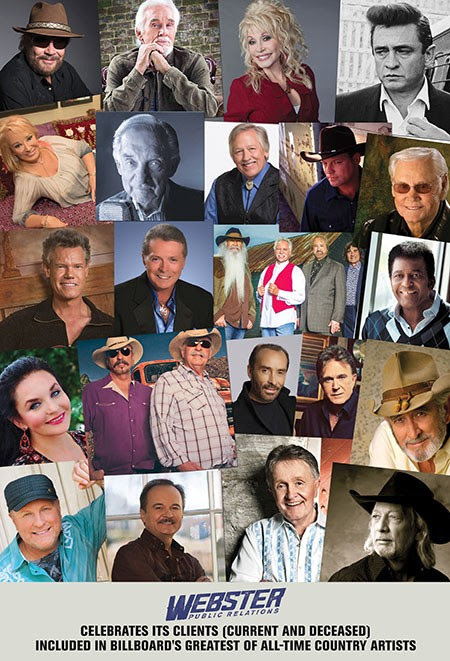 Collectively, our artists have sold hundreds of millions of records and Billboard's recent ‘Greatest of All-Time Country Artists’ chart proves it (list below). Webster PR’s client roster continues to tour year-around, record new music and entertain their loyal fan base, and can also be seen on such national TV series as Today, The Tonight Show, Fox & Friends and more. No. 13 -Hank Williams Jr. According to Billboard, the Greatest of All-Time Top Country Artists rankings are based on weekly performance on Hot Country Songs (from its Oct. 20, 1958 inception through June 4, 2016) and Top Country Albums (from its Jan. 11, 1964 inception through June 4, 2016). Titles are ranked based on an inverse point system, with weeks at No. 1 earning the greatest value and weeks at lower spots earning the least. Due to changes in chart methodology over the years, eras are weighted differently to account for chart turnover rates over various periods. Artists are ranked based on a formula blending performance, as outlined above, of all their Hot Country Songs and Top Country Albums chart entries. The full chart can be viewed on Billboard’s website here and listened to on Spotify.